Can students like routine Math task? Often students experience calculations of routine tasks as unpleasant and unnecessary. As teachers we know that they need to exercise to get a satisfactory or preferably a good level in numeracy skills. Learning games is one way to make mechanical practice interesting and securing basic skills. In the teaching experiments it has been noticed that proper games can be used to develop e.g. problem-solving skills and reasoning ability. When using learning games, the implementation of the objectives of the core curriculum can be promoted. Using suitable games the reasoning and evaluation skills of the pupils can be strengthened. We use the word Learning Games for board games on paper and Interactive Tasks on tablets and computers. In Paths to Math we have one or more board game almost in every module. Before the lesson the board has to be printed and usually players need some marks. There can also be a game where you need chessboard and two knights. The theme of the game is the same as in the learning area. E.g. Playing Piggy is a game to reinforce the operations with rational numbers. In this game, like in many others, the number of players can be from two up to teams. Every game has rules for playing, duration, winning and possible alterations. When students can play and plan the games and their rules, it will promote the development of the creativity. The playing offers challenges to both good and low-attainers. Student of today wants to use modern technologies, which are also an excellent help for practicing routine tasks. 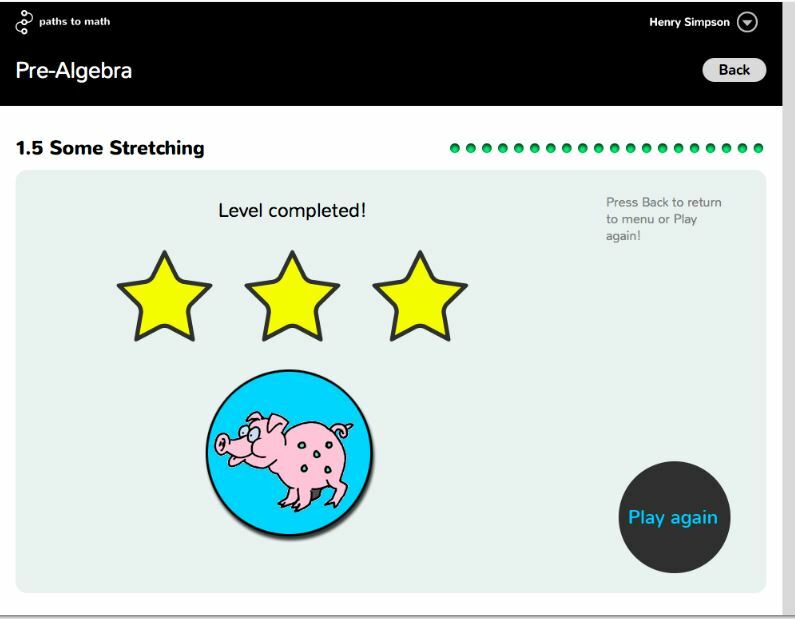 In Paths to Math we have one or more interactive game almost in every module. Games are ready to use every time and every place. If the teacher doesn’t have a tablet or a computer for every student, the games can also be played in pairs or it’s easy to arrange playtime in a different part of the lesson. There are 20 questions involving the learning area. The game is offering a new question, if student doesn’t get it right the first time. Student can continue also after answering wrong, but doesn’t get as many rewards as possible. The game is rewarding with different amount of stars and for the best results also different kind of pictures. Student can collect different kind of pictures. Students come to school because they want to be together. Learning is a social activity and the role of the schools is to provide challenging and innovative learning experiences for them. Learning games give students a good opportunity to play together and learn at the same time – sometimes they don’t even notice that they learn and enjoy! http://marketing.pathstomath.com/wp-content/uploads/2013/04/paths_to_math_logo_340x156.png 0 0 Maarit Rossi http://marketing.pathstomath.com/wp-content/uploads/2013/04/paths_to_math_logo_340x156.png Maarit Rossi2013-10-14 06:09:492013-11-12 22:18:56Can students like routine Math task?